This category honours the work of Bert Ireland, engineer of the ‘Shooting Star’ winner of the 1949 Apex Soap Box Derby. It is judged by our team of scrutineers. The Castlemaine Billy Cart Challenge was founded with the intention of bringing people together through fostering community partnerships. We encourage families, community groups, schools, service groups and other community organisations to work together on joint projects. Dr, Norma Gray was one of the early pioneers of Soap Box Derbies and Billy Cart racing in Australia, is a long time Castlemaine resident, has a long time family connection with the race and is a strong supporter of the values and goals of the Castlemaine Billy Cart Challenge. This category is in memory of Patricia Hay. No one loved a kooky community event more than Trish. She was also incredibly creative. Hence, we encourage people to get as creative as possible. This category is completely open to interpretation and is open to all billy carts- whether they race or not. Anything goes! Additionally, carts deemed unsuitable/too dangerous for racing can be entered into this category and still go home with a prize. 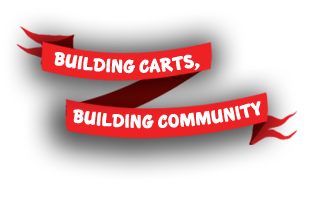 Carts may be designed with this category in mind, and not be designed to race at all. This category is sponsored by The Salvage Yard and will be judged on the best use of recycled/second hand materials. This is in the tradition of billy carts- making something out of nothing. Stay up to date with news and alerts! © 2019 Castlemaine Billy Cart Challenge.